Whether you're dealing with a leaky water heater or a blocked sewer line, you need a professional plumber who's fast, competent, and neat. When you call FIX MY PLUMBING PRO for Pinellas plumbing services, you're getting the very best in trust, local professionalism. We also offer prompt emergency services from our experienced team of pros. At FIX MY PLUMBING PRO, we cover all your Pinellas plumbing needs 24 hours a day, 7 days a week. Our team is also dedicated to quality service that is cost-effective for all your needs. From drain cleaning to toilet repair, contact us for reliable plumbing and sewer line services at an affordable rate. Before doing your own repairs, please be aware: ONE mistake and your home may be flooded. If you still choose to try the repair on your own, ALWAYS SHUT THE MAIN WATER INELT into your home prior to starting. When you finish, always open the valve SLOWLY. However, for less physical and mental stress, plus a warranty, give us a call. FIX MY PLUMBING PRO will give you fast, competent, honest, and neat satisfaction. Fixing one on your own might not be a good decision. Certain toilets require unique parts to flush properly, and these might not be available at your local hardware store. Also, valve inlets might need replacing when installing a new toilet. As we’ve said before, you’ll also want to shut off the main water. Instead, call us would be a wise choice. If your water heater is giving you problems and is over ten years old, it might not be worth fixing due to its original life expectancy. Water heaters build up with sediment and if the heating element on the bottom is buried within sediment, a new element will very possibly burn out shortly after installation. We can give you a FREE “on-site” estimate for cost of repair or replacement. This way, we can provide you with an accurate assessment based on your plumbing needs, as cost can vary job-to-job. But you can rest easy, because our standard water heaters come with a one year labor warranty and six year tank warranty. An extended warranty can also be applied for an additional fee. Do you notice a brown settlement or golden-colored beads in your water? Then immediately put the softener on by-pass and don’t use any water until you call a professional at FIX MY PLUMBING PRO. Prevention of further damage to your faucets, toilets, and water heater is important. 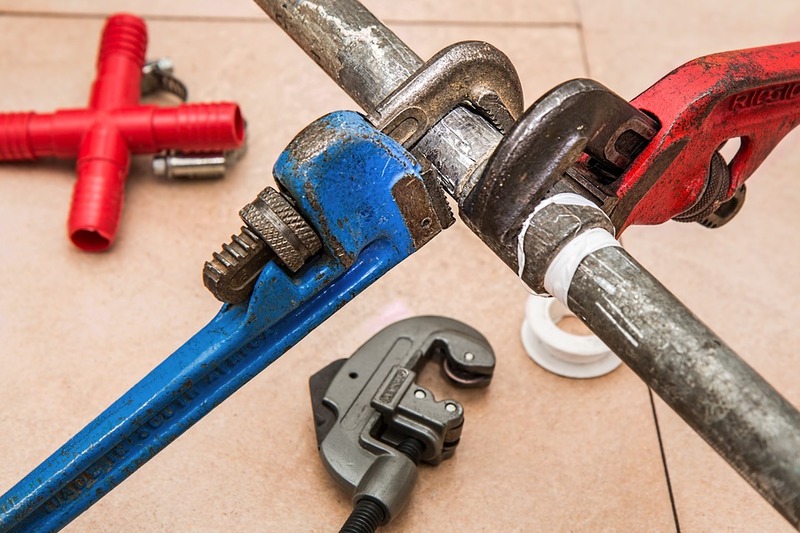 Although some plumbers might try to convince you to fix the old unit because it is quicker to repair than replace, it should be replaced if it’s over ten years old. It’s simply not worth spending hundreds of dollars to fix a unit of that age. When you call us, we’ll be able to provide you with a quick, accurate quote. We clean drain lines with a snake and when necessary, use a camera to locate any blockage problems, whether they be tree roots, grease, or a broken pipe. Home owners need to be aware of WHERE the sewer line clean outs area in the yard. These should be within four feet of the home and one near the sidewalk or an alleyway behind the dwelling. Unfortunately, they are frequently buried by mulch, grass, and soil buildup. If the roof is not too steep, roof vents can be utilized to snake or camera the lines. Safety issues will prohibit this if the roof is too steep, which will then require three interior fixtures to be snaked and/or camera. This includes a toilet, which will require removal at additional cost. You can also contact the city or county to come out to locate the sewer exits from your property line, possibly free of charge. Locating your clean out is a good decision. Many leaks can be located. Let us see if we can diagnose the problem and give you an estimate for repair before you spend the extra money, which can average $250 to $300 flat fee, on a leak detection company. Are you having a new refrigerator, washing machine, or dishwasher? Do you really want the unqualified DELIVERY MEN to hook up to water outlets that might now leak, as they frequently do after being turned off after so many years? Also, if there are many signs of leakage before the removal of the old appliances, they WILL refuse to reconnect to the new ones. Now you're stuck with unconnected new appliances, and with the hassle of disposal of the old appliances, as they might refuse to return for a free pickup. If you want pro, call us. Especially for the do-it-yourselfers, when remodeling your kitchen or bath, call us prior to installing new cabinets. It's a good practice to have the shutoffs removed and the water lines extended and capped. This will allow you to have small, neat openings in the new cabinets, and have positive shutoffs installed at the end of the remodel. If your professional remodeler will not do this, or oversees this, you know who to call: FIX MY PLUMBING PRO. And we'll make sure it's done the right way. Hope these hints have been helpful allowing your home repairs to be easier and less stressful. At Fix My Plumbing Pro, we offer you the experience, reliability, and convenience that you need for your plumbing needs. Additionally, we promise to provide you with the best customer service you’ve ever experienced. When you need plumbing services in Pinellas County, we’re only a phone call away.